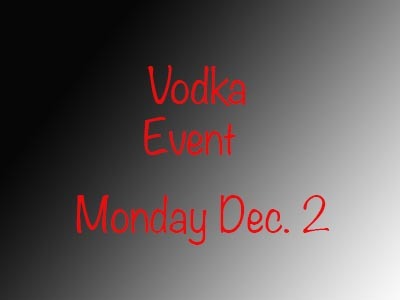 The Culinary Historians of New York and Astor Center are putting on an event December 2nd, exploring all things….Vodka! Really. Since vodka is a primary ingredient in the bloody Mary, I’ve got to check it out. I’m also amazed at all the new, small vodka companies that have been popping up– Spring 44 (love them), Juliet Vodka, Tru Vodka, Vixen Vodka, 42 Below, and many others. It’s interesting to think how and why they have come to be and what is is like going up against the big boys like Absolut, Greg Goose, Belvedere, and others. The event is at Astor Center, 399 Lafayette St., (at East 4th St.,) (upstairs). The main speaker is Patricia Herlihy. She’s is a specialist in Russian and Ukrainian history and the author of The Alcoholic Empire: Vodka and Politics in Late Imperial Russia, and Vodka: A Global History. Truthfully, I had no idea there were thick books written on vodka. But I was a History and Poli Sci major in college so these actually might be interesting reading for me. I’m in a book club and I think I’m going to recommend one of them. So much of the content is about history and culture, and that has always been an interest of mine. Here is an overview of what the event will be about. It sounds quite interesting, and I think it will make me and you think of vodka in a whole new way. Vodka has been the staple drink in Slavic lands for at least 600 years and is inextricably bound to their culture. Clear but powerful, this distilled beverage not only supplied an alcoholic drink for celebrations, but also fueled the Russian and Soviet economies. These days, vodka is blamed for Russia’s soaring death rates. So why has North America embraced this fascinating and versatile drink? And why has vodka overtaken America’s own native drink, bourbon? How has vodka gone global? Vodka distillers have packaged and pitched their product, just as consumers have come to define themselves through their choice of brands, and this packaging and branding reveals as much about vodka as it does about our own world. However vodka is drunk, whether straight, infused, flavored, or mixed, the history of vodka is a story of an old spirit transformed into the perfect postmodern drink. Mysterious in its origin, beguiling in its allure, vodka is a rising star. A big Thank You to Kelly S.
I wanted to follow up on the Group Dining Guide I had posted about yesterday. We had a woman who really found the Guide useful to her Shower search, and was very appreciative via email. We ended up helping her out with other details that went into her shower as well. She also invited us to her shower which was So. Darn. Nice. I sent Kelly a note wishing her Congratulations on her Shower and upcoming baby and I thought I’d share this little video with you.